There is a piece of good news for those single biker men and women who love to date on their mobile phones. Bikerkiss.com has published a new version of online mobile biker matchmaking recently, which primarily aims at helping motorcycle riders find the potential and ideal biker partners quickly. We should really thank the fast development of science and technology that allows men and women on motorcycle to achieve the dream of enjoying a biker dating whenever and wherever they like. In order to make sure that the whole online biker dating environment is safe, no fake photos or personal information are allowed to upload to the mobile biker dating website, which is a strict and uncompromising rule. After you register your basic profiles, interests and some other related information, Bikerkiss mobile site will list your best partners for motorcycle dating who share the same interests or lifestyles with you. Besides, if you want to meet up with more nearby motorcycle enthusiasts, BikerKiss mobile version can also list those bikers who have the same location with you. Despite that we can't guarantee this mobile biker dating service can help you find your true biker lover, you will absolutely find some other valuable things, such as a deeper understanding of two-wheel culture or the true meaning of biker life. Of course, BikerKiss mobile dating site is free for all riders as long as you have a mobile. If you are willing to try it, you will find more convenient ways to connect with other bikers. If you are troubled with having no time to open your computer, Bikerkiss mobile site may be the best tool for you to look for what you want. Nowadays, biker dating apps can be found everywhere. We have to admit that the biker dating app is a pretty creative and practical tool for biker singles to date with others. After all, biker dating app helps bikers to date on their mobile phones, which saves much time for them. However, not all biker dating apps are useful for you, and you should try to choose the best one according to your needs. One of the most famous biker dating apps in the world is the Bikerkiss dating app which is released by Bikerkiss.com. Like its cute name, this dating app devotes itself to helping all single motorcycle riders to look for their romantic biker kisses. 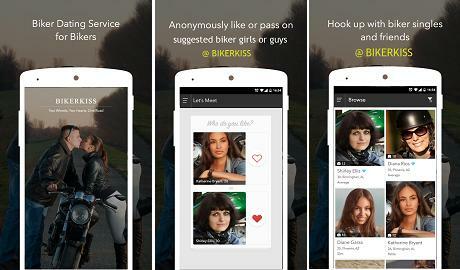 The simple but perfect interface of this Bikekiss dating app gives users a trustworthy first impression. Moreover, if you allow the BikerKiss dating app to access to your location, then it will show you those biker users who are around you on the screen of your mobile phone. But if you refuse to provide your location, you will be unable to use this function to search your nearby biker friends. In some sense, it means that you can seek a motorcycle dating wherever you are. If you hope to find someone you love or someone who loves you, you can send out your profiles to let more bikers know you. You can also take part in interesting activities to meet more motorcycle enthusiasts, such as the Biker Tattoo Show. There is no doubt that it is a free dating app to download. You might as well try to use it to enjoy a special biker dating experience. Of course, you can get more customized functions after you become its member. To know more about BikerKiss dating app, please try to download it below. It can be said that biker men are not willing to give up riding when it rains. But unfortunately, sometimes they have to. However, it is possible to ride in the rain and wind depending on the experience, skill, preparation and risk tolerance. Actually, riding in the rain can be a whole new subset of skills as long as bikers can take a try. Biker guys just need to accept it and see it as a challenge. Sooner or later, you will love to ride in the rain and wind. All bikers will agree on the value of a full-face helmet in a rainy day. Raindrops sting at speed, and things will be blew into the face by storm winds. Suitable clothing can be also vital when riding in the rain and wind. Prepare yourself rain suits that work well for lighter rain. Make sure your rain gear can help you better fight the constant winds that want to flow in and around the suit. Wearing a base layer that insulates when getting wet. Biker men may know that getting wet will make themselves uncomfortable, which will make them distracted. Riding in the rain, it is a big issue that biker men cannot see things due to the rain drops on the helmet shield and the fog inside. In place of wipers, Rain-X can help on the outside of the shield and anti-fog can help on the inside. Yellow or orange lenses eyewear can help biker men see things clearly. Wear hi-visibility colors to help others to identify you as a human when falling on the road. Motorcycle riders all know that the wet road in a rainy day can make it hard to drive well. Naturally, lower speed and move carefully on wet roads are the principle to ride well in the rain. Keep yourself relaxed and ride as usual. Accelerate smoothly and progressively use the brakes. The sipes and the cut in the treads need to be deep enough. Replace ordinary tires to rain-oriented street tires that have more sipes. When raining, the motorcycle will be like a little sail in the wind. Lighter bikes are easy to side winds. If leaning into a crosswind, bikers need to just stay upright. Some experienced riders know that riding parallelly with cars or larger vehicles can block the extreme crosswinds. But be careful not to ride in the driver’s blind spot. For those biker men who want to ride in the rain and wind, they should find out more riding tips online and try it again and again. Your rain riding experience is up to you. However, if you find that you are in a situation you feel it is hard to handle, just be relaxed and pull over quickly. Plan a two-week motorcycle touring with a bunch of friends or with your biker girl and accomplish it, which will be the best decision and memory that you will have in your life. You can take the smallest roads through the smallest picturesque towns, camp most of the way and see the country from a totally different and amazed angle. Of course, the best part of this motorcycle trip is not the places that you ride to, but the freedom and the feelings on the road. Of course, bikers will be safest and the most comfortable on their own motorcycles. However, it is possible that their bikes may be not the right type for the motorcycle traveling. Thus, hiring one from a bike rental company is the best choice. If you are planning to ride on big open highways, a cruiser may be the first choice, and a nimbler sportbike is suitable for twisty roads. When you are renting motorcycles, remember to inform the company your skills level and where you are planning to go. A motorcycle that you can’t handle or one that is wrong for the terrain will imperfect your motorcycle trip. The principle is to keep your luggage to the minimum. A bike can load as many as stuff as you can imagine, but you will have to unpack and repack all of it every day. So, just make sure that you have bring all the necessary stuff that you need on the road, including good maps, warm clothes, water, rain gear, sunglasses, sunscreen, earplugs, phone and charger, extra socks, flashlight, aspirin, basic camping gear if you plan to camp. Of course, there are other things you can bring depending on your own needs. Actually, camping has been more and more popular among bikers who are on motorcycle touring, which allows great flexibility in terms of the route, schedule and budget. There are cheap and free camping sites along the riding route, and you can also stop anywhere you find s pretty spot, then set up your tent and get up early for the next riding day at sunrise. If you are dating a biker girl, camping can be the most romantic dating for you. Besides, motels are also available at most of the well-known motorcycle routes. Keeping a positive attitude is the key. When things go wrong, even the most optimistic biker will get upset. So, try your best to keep yourself warm, dry, well-rested, fueled up, not lost and not ride beyond your skill level. Establish plans with every bike friend in your group or with your biker girlfriend about things that you should do when you get separated. Mark the meeting places on the map. Try not to ride too fast in case some slower riders will be easily left behind. If you are riding with your biker woman, just ride with her all the time, making it a date with a biker, not a race. Motorcycling has become more and more popular all over the world recent years. An increasing number of motorcycle enthusiasts get onto a bike to join this group. They reason why bikers choose to get involved and live a biker lifestyle may because of the excitement of solo rides or the pleasure of group rides with friends. The moment you start riding a motorcycle, you will strongly feel that it is the activity that you will never stop in the future. Since then, your life will become pure and simple. 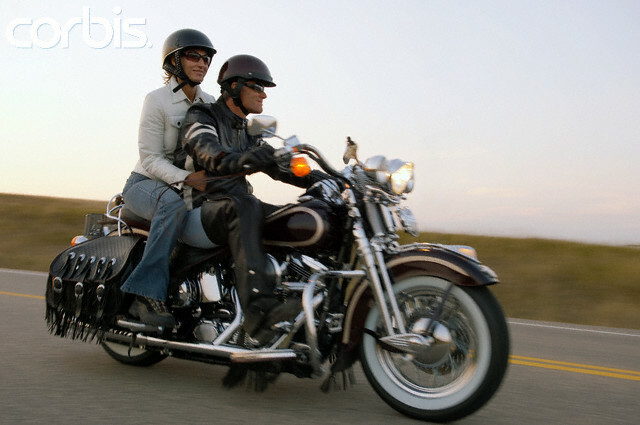 It is great to take up riding a motorcycle with a loved one, a friend or another biker you are dating. Motorcycling takes power to control. Riding everyday have a great impact on bikers’ health by exercising on the motorcycles. Moreover, it is also good for bikers’ heart health, reducing stress and improving sleep. Riding a motorcycle can help motorcycle riders to enjoy an improved mental state of mind and an improvement in their emotions. With a health body and a great mood, single bikers are more likely to meet more single riders for love and friendship. Getting outdoors can bring so much fun and joy to every bikers. Busy working life always keeps bikers in an office and have no time to get their bodies stretching. Besides, except for the work mates, there is no chance for bikers to meet single bikers in their working life. Motorcycle riding can get them in the sunshine to enjoy some fresh air and enjoy the freedom on the open road. Of course, riding to the best motorcycle routes near your town can give you more chances to meet like-minded biker friends and maybe meet an ideal biker date. The best part of motorcycling that can make you more social is that you can ride in a group with many other riding partners. Search for a local group riding or a motorcycle race schedule on biker dating sites and ride to the meeting place for a ride with some single bikers or biker couples. Anyway, you get the chance to make biker friends or meet single biker for love. Or if you just want to use the time to relax, you can ride alone at your own pace. Motorcycle riders can ride their motorcycles in the outdoors right throughout the year. It cannot stop by weather. Sunshine, wind and rain can only make the riding experience more exciting and more delightful. Of course, someone will argue that rain may be the obstacle of motorcycling. But with raining gear and equipment, motorcycle riders can feel free to ride in the rain and wind. Well, motorcycle riding is definitely a great and healthy interest for single men and women. It can be used as a tool to help singles find biker date for love and long-lasting relationship. However, once you know deeply about the biker lifestyle, you will realize that you are a real biker who is eager to discover the world on motorcycles.